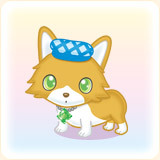 Nephrite is a small Pembroke Welsh Corgi who has light orange and white fur. He usually has green Jewel Eyes and wears a blue checked flat cap and a green jewel necklace shaped like a diamond. In Jewelpet, he is the partner of Akira Nanase. Nephrite appears to him to rid him of Diana's curse that caused him to become harsh to the kids he was teaching to play basketball. Like Ruby, he wants to see Akira and Rinko get together. In Jewelpet Kira Deco, he's a "cleaner-for-hire" (a parody of an assassin). He's an old friend of Coal and tries to help him defeat Ruby and her friends. However, he falls in love with her and ends up turning against Coal. In Lady Jewelpet, he's one of the dogs used to test the Petit Ladies' skill at dog-walking. He's partnered with Momona, to whom he's rude and unhelpful at first, but he takes a liking to her during the course of the episode. In the past, he did the same test with Lady Diana; his cynical attitude came from him witnessing Diana run away with Alto and leaving Luea behind. He's a minor character in the other seasons.